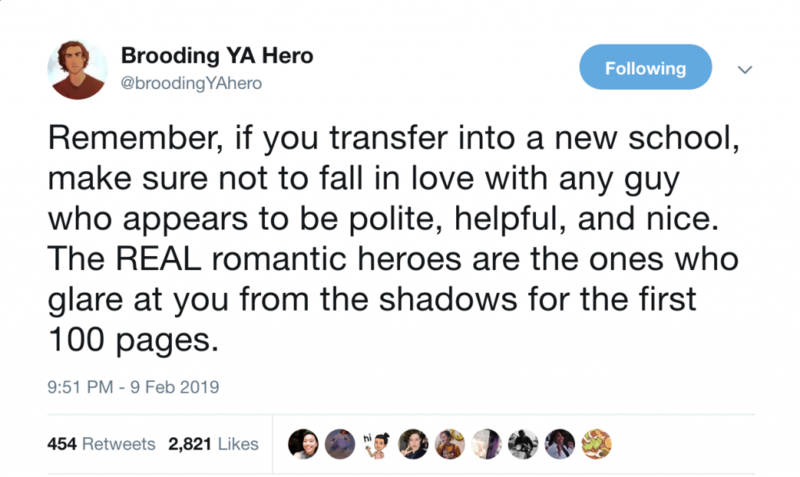 This tweet works because it is a trope in Young Adult literature to present the male hero of the story—also typically the romantic lead—as unpleasant at first impression. Yes, sometimes there is brooding, but the trope goes beyond that into the territory of true loathsomeness. The hero’s true self in YA stories is often concealed beneath a foul exterior, an impression meant to repulse the heroine for the sake of romantic tension and the accrual of conflict. The romantic male lead (hero) appears to be rather monstrous or foul or otherwise toxic, but turns out to be just the opposite once the female lead (who is usually the love interest) gets to know him, and voila, everlasting love is born! These stories are a dime a dozen, and the heroes are almost always young males who are royal and hiding their true (good) identities or intentions beneath a dark veneer—sacrificing their reputation for the sake of some higher purpose. The main point is that they actually, despite initial appearances, possess integrity, honor, and virtue. As predictable as this character arc is in YA stories, I can’t help but trace it back to the modern master of fantasy literature himself: J. R. R. Tolkien. Although obviously not an author of Young Adult literature, Tolkien’s influence is undeniable on all books, themes, and tropes in the genre, no matter the intended audience. When it comes to the typical romantic male lead, I don’t know that Tolkien did it first, but he certainly did it famously in the character of Aragorn, the longsuffering Ranger-king whose glory is hidden beneath rags, a gruff exterior, and an aspect frightening enough to set several traveling hobbits on edge. The first time Aragorn comes into the story in The Lord of the Rings, he is indeed glaring from the shadows, just like our brooding YA hero introduced in the tweet above. When the hobbits Frodo and Sam first meet the rightful king of Gondor, he’s passing himself off as “Strider,” a mere Ranger. In deciding whether or not to trust him, Sam says, “You have frightened me several times tonight, but never in the way the servants of the Enemy would, or so I imagine. I think one of his spies would—well, seem fairer and feel fouler, if you understand.” To which Strider replies, “I see. I look foul and feel fair. Is that it?” Obviously this exchange is not a romantic encounter, but the main principle of the trope applies. Aragorn of Gondor is concealing his true nature beneath the guise of a Ranger until the time is right for him to ascend his throne. His disguise is so effective that discerning people, like Sam, must seek for what our hero feels like underneath, circumventing what can be seen on the surface. The “sudden joyous turn” (to borrow further from Tolkien) of discovering that the hero is not “only a Ranger,” or as “foul” as they seem, is the reason the Aragorn Hero proliferates as a Type in stories to this day. The many (many) heroes who appear in modern YA stories walk similar paths to Aragorn. Why does this theme repeat and appeal to a YA readership, specifically, though (which is often much broader than the actual young adults for whom the books are ostensibly written)? From Rhysand of the Night Court to Prince Cal to Jace Wayland to Caliph Khalid to Prince Brigan… I could go on for a long time naming heroes of the YA world who fall, even tangentially, into a Strider/Aragorn mold. I think it exists specifically in the YA space for a reason: hope. Hope abounds in stories for young people far more than it is present in adult literature, and it is one of the main reasons adult readers flock to YA books despite being “aged out” of the target audience. Hope that insurmountable odds will be surmounted. Hope that people really aren’t as bad as they seem on the surface. Hopeful belief in the incredible, unlikely, unloveable, and unbelievable. Hope that the hero will be redeemed of his seeming “foulness,” that the one who appears as a villain will turn out to be a hero, that the brooding man in the shadows will be the savior of the world. Young people more readily give in to hope, and adult readers of YA crave the easy hope of their youth, whether as escapism from the crushing bleakness of adulthood, or for the simple joy it brings to remember what it feels like to love without skepticism, to feel chest-constricting emotions, and to embrace the impossible without caution or care. Where more “mature” works of literary fiction often present stories of realism and people as they are—rigid, unyielding, resistant to change, YA stories present heroes who consistently defy expectations—who “look foul and feel fair,” who fulfill the wish that the “bad boy” isn’t so bad after all. But the repetition of the Aragorn Story—of the hero who “looks foul and feels fair”—in YA stories offers us insight into our longing for the redemption and the existence of such men. Would that every real-life relationship between a hopeful woman and a tormented man resolve as romantically as those in the most successful YA stories—that every harsh exterior concealed a heart of gold. But stories, even the most fantastical ones, are mere imitations of the real world, not the real world itself. And if there is any area in literature that truly stretches secondary belief, it is probably this trope. Most men who seem foul, sadly, truly are, and remain that way, and women should not get into relationships with them seeking the “fairness” beneath. But the repetition of the Aragorn Story—of the hero who “looks foul and feels fair”—in YA stories offers us insight into our longing for the redemption and the existence of such men—the longing and the search for nobility, humility, integrity, and virtue beneath sometimes brooding, callous, or even foul exteriors. Each iteration of this trope plays out differently according to authorial whims, and of course discernment should be used when considering which stories to consume. But while in many cases these YA stories amount to little more than wish fulfillment, like the best stories and tropes, they hit on something much deeper—in this case, a reminder that at one crucial point in human history, royalty did come down and clothe himself in rags for our sake. He did indeed “look foul and feel fair,” up to the point where he defied death, effecting the greatest eucatastrophe of all time. Insomuch as a romantic brooding YA hero trope can remind me to think upon such things, I will hope, and I will call such stories good.